Gold bearing quartz is one of the most rare types of natural gold that you can collect. The vast majority of gold mined today is produced by blasting and crushing ores to extract the gold. Very few large scale mining operations retain the larger collectable pieces that they produce. With the high prices of gold, extracting and refining the metals is generally more cost effective than separating out the high grade gold in quartz specimens to sell individually. Thus, very few quality pieces are seen available on the market. Small scale prospectors occasionally recover gold in quartz specimens, but by far the vast majority of gold recovered is in the form of very small flakes and dust. Another aspect of gold in quartz worth understanding is that there is a huge difference in quality between various pieces. Each individual specimen should be evaluated based on its overall aesthetic beauty, since no two gold bearing quartz pieces are ever the same. Above is an excellent example of a gold in quartz that is extremely high quality, and would certainly command a premium price to a mineral collector. Many crystalline gold piece have been recovered from the Round Mountain Gold Mine in Nye County, Nevada. The gold forms in an unusual dendritic pattern, which is very rare to see. To a mineral collector these piece is worth several times that amount. Another example of gold in quartz is shown to the right. 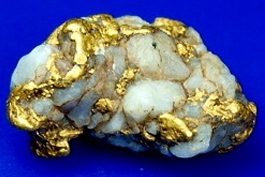 Notice how this piece is rounded and water worn, similar to a typical gold nugget. Often gold that spends much time in a creek or river will have most of the quartz worn off by erosion. This spectacular piece retained much of the quartz, and has an amazing 50/50 matrix with gold. The quartz is nice and white, without any iron staining, and the gold is bright and clean, indicating a high purity. This lovely little piece of natural art will also command a premium to a collector. Many jewelers also seek out quality pieces of natural gold in quartz to incorporate into jewelry. They are often cut and polished into cabochons, which can then be incorporated into rings, pendants, cufflinks, and other decorative jewelry.